hi guys thanks for add me in this fantastic forum. BUT, yes BUT one day they ask me for the business authorization, i sell all to amazon and it go for 6 months, after my account was blocked because they say my account was linked?????!!!!!!! really guy, i never had a other account and no one use my pc for login with other account. Now, is 3 years that i don t create a new account, whats change in this time? So basically, you have all the new data, except for your registered business? Did you consider opening up a new LTD (S.r.l.)? Or even registering on amazon as a person (not a company)? is easiest maybe respect to amazon.it?but when i make a amazon.uk account i can sell on italy? 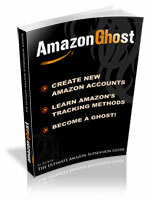 You can sell in Italy with Amazon UK account. If you need one - drop me a PM. You can also appeal your account suspension and you can open another stealth Amazon without any issues.